Picking up R can be tough, even for seasoned statisticians and data analysts. 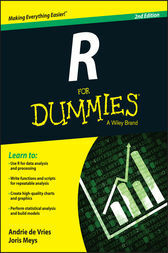 R For Dummies, 2nd Edition provides a quick and painless way to master all the R you'll ever need. Requiring no prior programming experience and packed with tons of practical examples, step-by-step exercises, and sample code, this friendly and accessible guide shows you how to know your way around lists, data frames, and other R data structures, while learning to interact with other programs, such as Microsoft Excel. You'll learn how to reshape and manipulate data, merge data sets, split and combine data, perform calculations on vectors and arrays, and so much more. R is an open source statistical environment and programming language that has become very popular in varied fields for the management and analysis of data. R provides a wide array of statistical and graphical techniques, and has become the standard among statisticians for software development and data analysis. R For Dummies, 2nd Edition takes the intimidation out of working with R and arms you with the knowledge and know-how to master the programming language of choice among statisticians and data analysts worldwide. R For Dummies, 2nd Edition is an ideal introduction to R for complete beginners, as well as an excellent technical reference for experienced R programmers. Andrie de Vries is a leading R expert and Business Services Director for Revolution Analytics. With over 20 years of experience, he provides consulting and training services in the use of R. Joris Meys is a statistician, R programmer and R lecturer with the faculty of Bio-Engineering at the University of Ghent.